Amy was April’s hair and make-up stylist at April and Chris’s wedding in Australia and when Craig mentioned that he wanted to do a post-wedding “trash the dress” sort of shoot, Amy jumped at the chance. 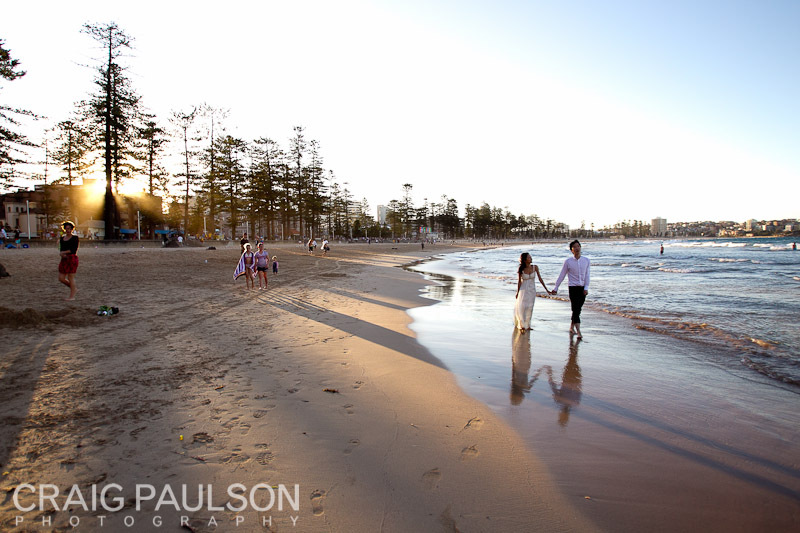 Craig took Amy and her husband Harry to Manly Beach which is one of Sydney’s famous Northern Beaches and a great surf spot. Walking among the sun worshippers while dressed in their wedding clothes, they happily splashed through the waves and let their hems drag in the sand without the worry of having to be presentable at their reception later. Amy and Harry look so relaxed and happy as they let the waves wash away the stress of daily life and enjoy a brief return to the quiet moments of couplehood. Craig is so glad he was there to capture those moments for them.